Make your statement with this special dog-person necklace in pure nickel silver, copper and sterling! The nickel silver base is etched and patinaed in a turquoise tone; copper hearts stamped with paw prints are a lovely contrast. 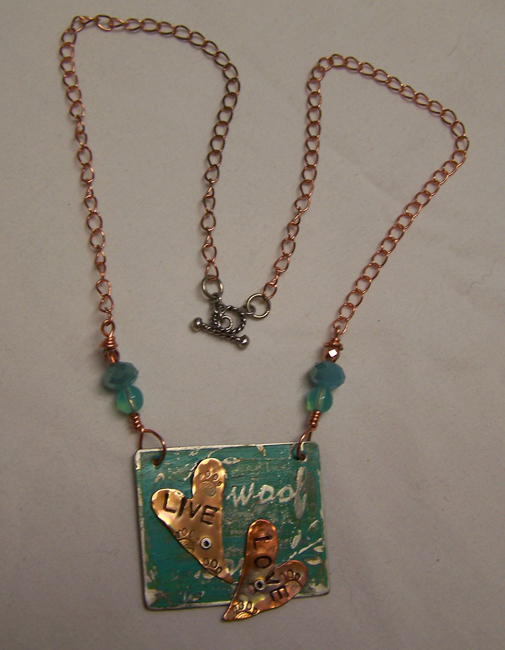 The delicate copper chain is 17" long, and fastens with a small sterling toggle. The pendant measures 1 3/8" x 1 3/4", and is stamped on the back with my jeweler's hallmark. I've finished the piece with Renaissance Wax to protect the patina. From one rescue mom to another!